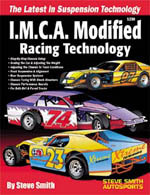 Everything you need to know to build, set-up and race a modified-style car competitively. Includes front suspension system refinements, getting the proper roll center and camber curve, setting bump steer, all rear suspension systems - 3-link, swingarm, coil/monoleaf, and 4-link, Panhard bar tech, shock absorbers, the braking system, setting ballast and weight, choosing springs and shocks, chassis tuning and adjustments, solving handling problems, complete chassis set-ups for both dirt and paved cars, and much more. Over 300 photos and illustrations. SPECIAL PACKAGES: Buy the S280 book & V184 video for $62.95. Or, buy the S280 book, V184 video & B600 blueprint together for $74.95.